Stone Brewing Dr. Frankenstone is a “monster IPA” that’s actually a blend of Stone’s Ruination Double IPA 2.0 and Stone IPA. Sounds awesome, but the beer is only available on draft. The good news is, Stone wants you to experiment with Frankenstein-like blends of your own at home. Their suggested recipe for a blend they’re calling the Grim Ripper: 1 park Stone Ripper and 1 part Stone IPA. Okay, just about every beer Burial makes could be considered a Halloween beer (they’ve got a thing for death imagery), but Scythe IPA goes all in on the creepy imagery. It’s brewed with malted rye, Belgian Cyrstal malts, Mosaic, Columbus and Chinook hops, and it’s available right now. Urban Artifact, in Ohio is releasing a mixed Trick or Treat 12 pack this weekend to celebrate the spooky holiday. Four of the flavors will be “treats” and two will be “tricks,” with flavors that are a little bit weird. New Holland puts out this pumpkin beer every fall. It hits all of the pumpkin beer notes you’re looking for: cinnamon, nutmeg and, um, pumpkin. Also, dude has no head. AleSmith Brewing releases Evil Dead Red to celebrate Halloween every year. It looks like blood, but has tons of malty, bready notes balanced by a heap of citrus hops. Sweetwater Brewing opened their Woodlands Project, an experimental arm of the brewery that focuses on large format, kind of weird beers, almost a year ago. And it’s already produced some fun one-offs. This one is a barrel-aged stout with vanilla, coffee and chocolate. It’s releasing this weekend, just in time for Halloween. 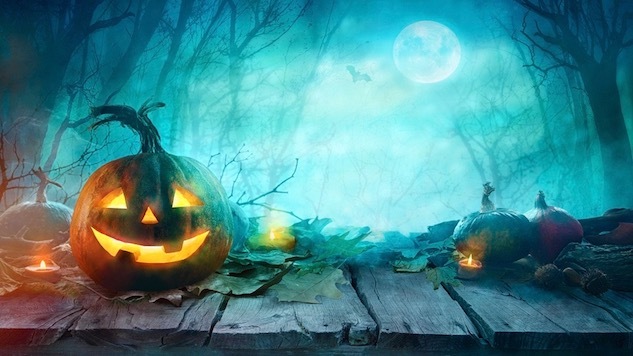 Halloween is rapidly approaching, and while kids are getting psyched about the buckets of candy they’ll extort from their neighbors, adults have reason to be excited too. Because breweries all over the country celebrate All Hallows’ Eve with special, limited beer release. We picked a six pack of spooky beers that we’re excited to drink this Halloween.